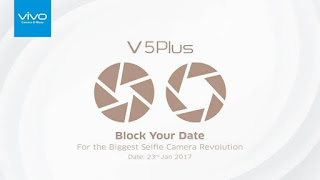 Vivo launched Vivo V5 with 20MP front facing camera in India last month company has introduced Vivo X9 and X9 Plus in China with Dual front camera as announced earlier Vivo to launch V5 Plus smartphone in India Dual front camera on January 23 expected to be priced at Rs 21,990. Vivo V5 feature a 5.5-inch HD Display (1280 x 720 Pixels) with 2.5D Corning Gorilla Glass powered by an Octa-Core Processor coupled with 4GB RAM and 32GB of internal storage that can be further expanded to 128GB through a micro SD card. On camera, it has a 13MP rear with LED Flash camera and 20 MP front facing camera with LED Flash, Sony IMX376 sensor F/2.0 Aperture. Dual SIM device runs on Android 6.0 with Funtouch OS 2.6. Vivo V5 is Packed with a 3000mAh Battery. Also, comes with Fingerprint Scanner. Connectivity options include 4G VoLTE / 3G, WiFi 802.11 b/g/n, Bluetooth 4.1, GPS. Vivo V5 to measures 153.8x75.5.7.55mm and weights 154 grams.